A new self-contained "protection package" that senses dangerous concentrations of toxic or explosive gases, then automatically turns on its own warning lights and horns has been introduced by Sensor Electronics of Minneapolis. This unitized "protection package" mounts anywhere, plugs into any convenient 110-volt outlet, then goes to work. If protection needs change, the unit can be quickly and easily moved to a new location. The "package" can spot any of more than 100 toxic/explosive gases, then flash an immediate alarm the instant gas levels exceed preset LEL (for explosive gases) or PPM (for toxic gases) limits. 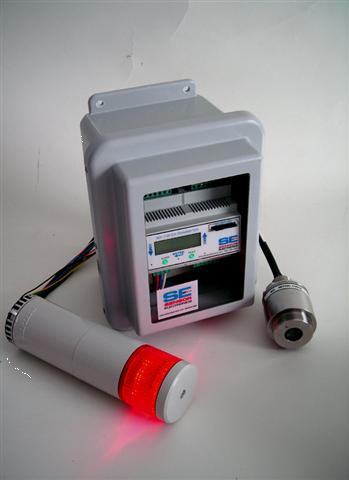 The "package" includes a factory-tuned gas sensor; a power transmitter with integral LEDs that change from green to yellow to red as gas concentrations increase; a digital readout panel that spells out actual gas levels in LEL or PPM; and a flashing red strobe light and powerful horn to warn of alarm conditions. Components are mounted in a rugged enclosure. The unit can be hard-wired or plugged into an outlet. 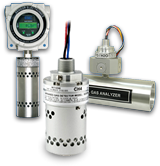 Components work for years without initial run-in, fussy adjustment or recalibration. The unit can be moved from point to point without requiring sensor reset. If desired, the alarm light and the sensor can be separate from the enclosure. Besides watching for dangerous gas levels, the package keeps a beady eye on itself: If anything goes amiss in the systems the digital panel spells out what’s wrong where. Detected gases include the usual suspects – CO, CO2, HCl, SO2, diesel and aviation fuels, gasoline, alcohol, methane, propane – plus esoterics like tetrafluoride, ethanol, dichlorosilane, nitric oxide – in all , more than 100 different gases.